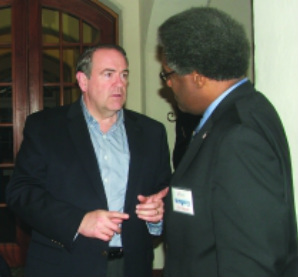 As presidential hopeful Mike Huckabee pointed out, and correctly, during the latest debate (28 October), Social Security is not an entitlement program. 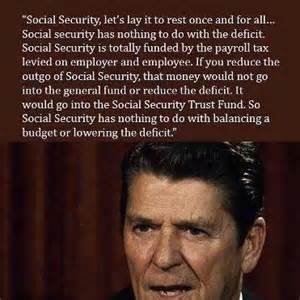 Some may find this statement of fact rather peculiar, since a majority of those on the debate rostrum have suggested, at one time or another, that America would be better off if we were to have alternatives to our entitlement programs including Social Security. 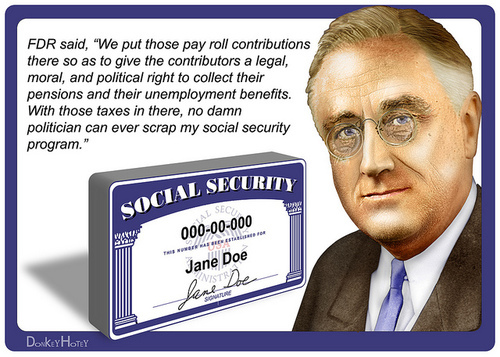 Social Security is an earned benefit, bought and paid for through decades of hard work. Every payday since we began working, we have contributed 6.2% of our income, matching our employer’s 6.2% paid into Social Security on our behalf. These contributions over a lifetime of work provide a modest but guaranteed monthly benefit for life. Without this earned Social Security retirement income, the poverty rate among older, previously middle class Americans would be staggering, and unsupportable. Adding Social Security to the list of government programs that some politicians want to kill off, like the oft repeated statement that suggests that government ought to be run like a business is a mantra. A mantra is defined as a powerful word or phrase that may or may not have meaning that is often repeated for purposes which are often highly esoteric, but adds nothing to our understanding of the way things actually work or are organized in the very real world with which each of us must interact. Perhaps, the reality that Social Security is a government mandated involuntary savings program to protect each and every citizen against unforeseen, yet actuarially predictable occurrences, the fact that the budget cuts proposed by Ryan, were to achieve 62 percent of those cuts by eliminating programs for Lower-Income Americans, is why Ryan's budget plan is seen as a double cross practiced by the high priest standard bearer of double standards. Of course, the true nature of Social Security does not sit well with those who for purely political reasons opposed yet another attempt by government to mandate that citizens protect themselves, rather than protection falling on entitlements when circumstances are such that one cannot care for themselves. Take for example the following interview this author conducted with an individual, a 50-something years-old clearly middle-class suburbanite, who had recently been diagnosed with cancer that had affected the liver, kidney, lungs and lymph nodes. The interviewee asked that the format of the article assume a form that would allow them to dictate a letter to three great American Presidents, with the hope that a fourth will appear on the national stage to sort this problem out. I woke up one morning with cancer and that was the beginning of the worse days, weeks and months of my life. My employer for whom I had worked diligently for many years insisted that I take Family Medical Leave (FML). Based mostly on a recent experience in which another employee who had continued to work after they had begun cancer treatment, passed out and fell down while at work. That decision brought my bi-monthly paycheck to an abrupt end. I immediately applied for Social Security Disability (SSD) since I had paid into the trust fund since my first job at age 16, only to be informed that 'under the law, SSD payments cannot begin until I had been disabled for at least five-full months.' , that is, payments, can only begin on the 6th month anniversary of one’s documented disability. I was made all too aware that only after one has received disability for a full 24 months, does one then qualify and become eligible for Medicare. Incredibly, that meant that not only would I not have an income for 6 months, but that I would be required to pay the full cost of my medical insurance including my employer's previous share of the costs for the next 24 months before I would qualify for Medicare. This is the present circumstance in spite of my decades-long contributions to the Social Security Trust Fund. The cost of the insurance alone amounts to fully 1/3 of my total SSD monthly stipend. As a result, I have had to sell property; cars, household furniture as well as completely spend down my savings, cash in investments and insurance policies just to cover basic needs like shelter, utilities, and occasionally have enough money to buy food for 6 months till my first SSD payment was received. The 6 month waiting period left me in a state that can be clearly described as double crossed by double standards. I was forced, under penalty of law, to pay into the Social Security Trust Fund , and yet when I needed it the funds that I had set aside for just such eventualities as I found out, are not available to me. To make things worse, my SSD payment amount places me at an income level just above the poverty level, making me ineligible for any of the entitlement programs that my tax dollars fund, which Social Security is not one of, like meals on wheels or a ride to the doctor office for chemo-therapy. My budget leaves me with $20.08, at the end of every month for a rainy day fund. When I calculate how much I paid into the system vs. the amount of my current monthly payments, I would have been better off managing my own trust account for the past 44 years. The problem with this approach is that whenever there is a large amount of money accumulating in a fund of any kind, some government agency or private financial institution starts thinking of it as their money to use and return to the fund at a later date. That is precisely why the Social Security Trust Fund has not grown beyond the amount of the actual contributions to it, because the interest it earns has been used by successive administrations to pay for things that the Congress would not. Congress would not because they could make the administration pay for the programs it wanted, while at the same time claiming that they have safeguarded the public purse. When in reality, both the Congress and the administrations were in concert stealing from the future of all American citizens's they age , die and leave benefits to their teenagers link Paul Ryan, or become disabled. At even a modestly low rate of simple compounded interest, I would have accumulated over a 1/2 million dollars after four decades of paying into the SS Trust Fund, giving me a 6 figure income for the next 5 years, or 1/2 that income level for the next 10 pushing me past a 70 year old family history life expectancy. Income levels that are far above any poverty level means tested benchmark. And yet, as things stand I have been double crossed and just plain screwed up by being screwed over. Its a low down dirty shame. All thanks is due Mike Huckabee, who at a time when the truth is often the first casualty of a heated debate, stated the truth - Social Security is not an entitlement program, but a forced savings system which assesses a 6.2% contribution from each and every employee and each and every employer from each and every paycheck that is earned over a lifetime of work. Social Security was designed as a forced saving plan that the government would hold in trust. And the American people were led to believe that the essential nature of that trust is what was once enshrined on American money - In God We Trust. And now, after four years of the legislative disaster that was the obstructionist John Boehner, the grossly out of touch Republican majority congress has chosen Paul Ryan as its leader. Paul Ryan, who received Social Security survivors benefits himself when he was a teenager, and whose infamous federal budget balancing plan was largely based on a mistaken assumption that Social Security was a federal tax-based deficit-affecting funded entitlement program, is now third in the line of succession. These are dangerous times indeed for the 57 million, their widows and children that have kept the Social Security Trust Fund fully funded by their decades of sweat and toil, now that the next heir to the triumph of politics, over sound judgment and policy development, throne has been crowned. God bless the United States of America in these troubling times, and give guidance to the new speaker of the house so that he might remember, or learn, that the truth serves America best, and that the American people, all of us, deserve no less. The Social Security targeting new speaker of the house, Paul Ryan, may fit the conventional wisdom understanding that people get the leadership they deserve. And that may well be true of the current Congress with its less than 14% approval rating, but it is not true of what the American electorate deserves. Nor do I think that the American people can write Ryan's election to the leadership off as a desperate 23rd-hour emergency compromise, but must be seen in its true light as just another very very bad decision, in a long list of very very bad decisions made by this do-nothing, know-nothing congress.